Since you are most likely to be bitten in your house or out in your yard, it’s important to know what to do to limit your exposure. It doesn’t take much. Knowing what to look for and a little regular maintenance is all you need. Ticks like to hang out on long blades of grass most of all. They also like rock walls, logs, under decks, and other nice hiding places. 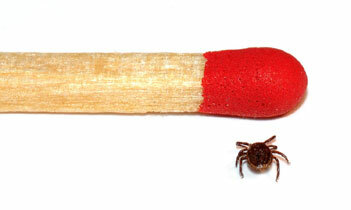 Ticks can also drop off of hosts and reproduce. So knowing where the hosts might hide and eliminating them is a good place to start. Keep your yard weeded and clear of brush and clutter. This eliminates a lot of potential dangers including mice, ticks, mosquitos, and other pests. If you plan to grow vegetables, rotate your crops to ensure nutrient balance and soil health. Plan your plantings to encourage soil health and reduce pests. This is often all you need. If you feel you need to use pesticides, or if there is an infestation, you have several options. Fertilizers and Pesticides do not have to be toxic. Besides the obvious immediate effects they have on the environment, they also result in soil lacking essential nutrients for healthy plants, and they leach toxins into the groundwater which kills fish and wildlife, and ultimately ends up in our drinking water. All in all it’s not necessary. Essential oils and other natural alternatives tend to work so much better in eliminating yard and garden pests (See the Essential Oils page for more information). They are still very potent and contain chemical compounds. Caution should be used. Natural isn’t always better, so read the ingredients. Keeping a healthy garden and soil for prevention is the most effective. You are most likely to be bitten in your own home or yard.